Vietnam, oh Vietnam, you were a typical last minute decision. The original plan though deviated miles from the final trip. Originally I had planned to make my way to Mui Ne Beach to go kitesurfing. Last minute I had a change of heart. In the end, Mui Ne would have probably not been the best decision for me as a beginner since I read the surge and currents can get quite strong and the sea is mostly choppy and not very beginner friendly. So I canceled all my reservations and came up with a new idea – first exploring the south of Vietnam and then going to the north to travel to Hanoi and to see the world heritage Halong Bay. 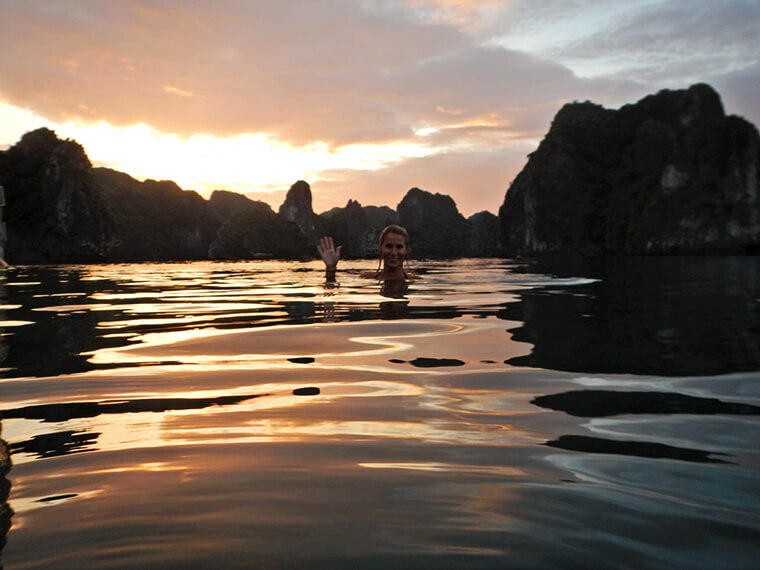 Within only hours I had checked out various offers and had my additional flights, accommodation and an epic 3-day boat trip at Halong Bay organized. Sweet change of plans! First flight to HO CHI MINH CITY, first impression: finally some fresh air compared to Singapore, but then ‘Please contact your bank’ – oh, come on – after trying 5 different ATMs finally the feeling of relief when I finally got to withdraw 2 Mio. (VND of course). Taking a cab to town is quite cheap, taking the bus where no one spoke a word of English is even cheaper and way more adventurous, sure I chose the latter. Just check out which bus to take via google maps before and then just hope for the best. I did not use any of these offline map apps. Call it laziness or stubbornness – I must really have quite a good sense of orientation since I always somehow found my way. Boarding the bus I had not a clue where to get off though so I randomly just got off close to where I assumed my hostel would be and after wandering around I actually found it. I was staying at the ‘3 Lá Vegetarian’ at 32A Cao Ba Nha, District 1 – such a cute place with big comfy beds and very good traditional breakfast included in the price. Throughout my travels, I booked most hostels through Booking.com which I can totally recommend since they upgrade you to a so-called ‘genius’ status after a couple of bookings which enables you to get 10% off the price or other deals like free airport rides. I only had 2 days in Ho Chi Minh City, or ‘Sai Gon’ which the locals prefer calling their city. On my arrival day, I explored the CITY BY FOOT again. Don’t let that local traffic scare you and just start walking and cross the street whenever you feel like i. Just look left and right and you’ll be fine…even though it doesn’t feel like it the first couple times. That day I ate and drank everything I came across, like a whole lot of Mochis, shrimps and pork fried on a stick and orange juice I bought from this cute old lady selling it off the street sitting on the ground. My mission to visit the botanical gardens ended up with me successfully running past it without noticing. One thing to see apparently is ‘Ben Thanh Market’! I thought it was horrible and I felt very uncomfortable since people were constantly trying to persuade me into buying things. The day ended with a tasty Matcha Shake with Matcha Jelly and a traditional Phó. Due to limited time and my constant drive to see as much as possible, I ended up booking a day tour to the MEKONG DELTA through my hostel which was only 14$ all in. The bus took 4 hrs. one way. The English our ‘english speaking guide’ spoke was ‘interesting’ so I was happy to just listen to some music and observe the people on the streets. It’s remarkable what Vietnamese locals can transport on a regular scooter. 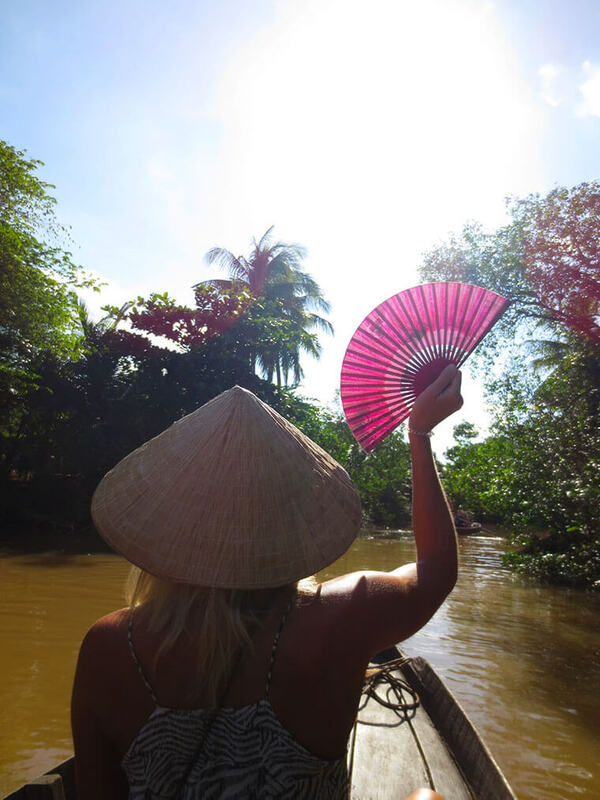 The day included a traditional boat tour to the floating markets, a presentation of local crafts and candy tasting, a bike tour through the jungle with lunch at a hidden restaurant and another boat tour on the Mekong river in a bamboo canoe. What a great day! What do you do when your flight is leaving late and you want to make the most of the day? Right! Book another half-day tour to the CU CHI TUNNELS. The street where my hostel was was too tiny for the bus to pick me up. So, the guy from the hostel always dropped me off with his scooter, happily smiling. As for the revolutionary sight, it was very impressive to hear more about the history behind it. It’s a systematic tunnel network the Vietnamese built and used to hide in the Vietnam War. There are parts you can crawl through when visiting the area. I am not scared of many things but narrow tunnels freak me out. No reason to keep me from giving it a go though. Let me tell you, I got the hell out of there and took the first exit right away. But hey, I tried! At the end of the day I almost missed my flight due to unexpected traffic jam. I had gained a composure though that kept me calm in these of situations (‘Don’t stress about it now. If you miss your flight you’ll figure something out!’). I found a cheap shuttle from the airport to take me to my hostel in the late evening hours. Not expecting the worst from people I almost got robbed when asking someone for the directions. In general, I must say I was very cautious walking around by myself, though. Again, the street was tiny but the hostel with the original name ‘The Original’ was great. 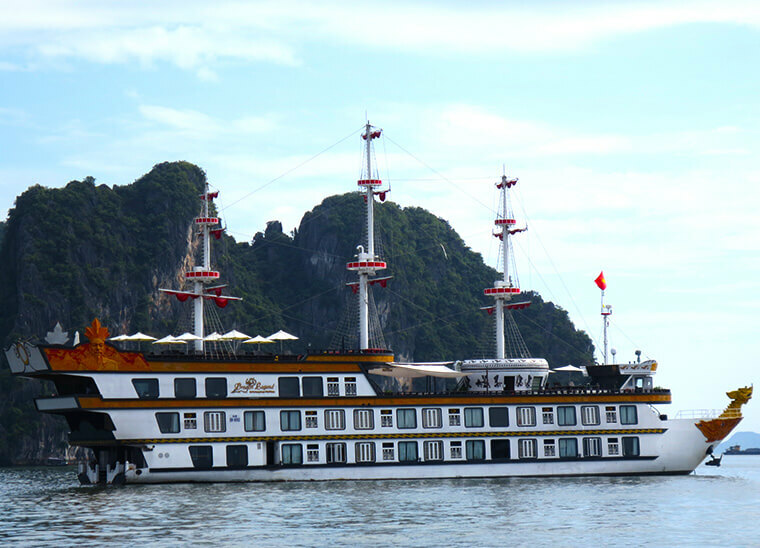 The next day I left right for my HALONG BAY cruise on the ‘Dragon Legend’ that I had booked with ‘Indochina Junk’. The operators pick you up and bring you to the harbor where a tiny boat brings you to your beautiful junk. Since we had 3 days booked we left the 1st day and stayed out in the Halong Bay area for the whole time. The various operators own different islands of the world heritage and are therefore entitled to visit certain areas others are not allowed to enter. 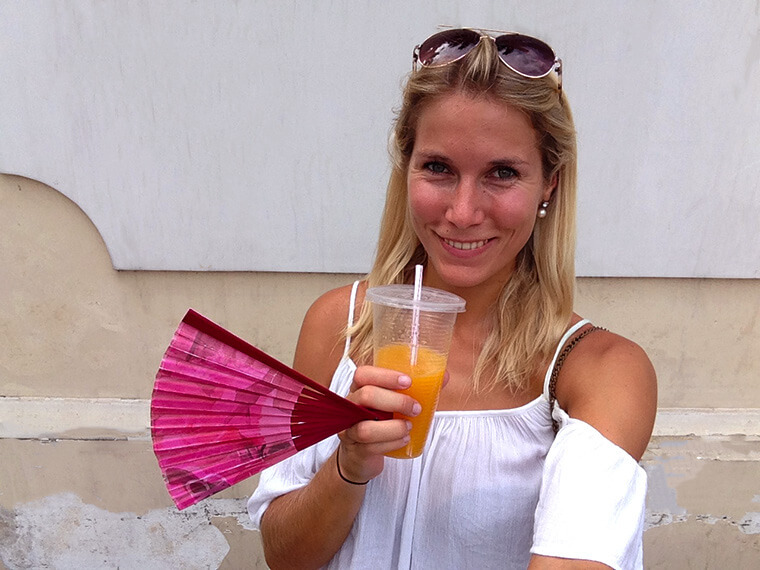 Our operator’s trip was a great deal and a little treat for all the hostel hours to come. I didn’t even have to pay an extra fee for occupying the big fat king size bed by myself which normally results in a surcharge. 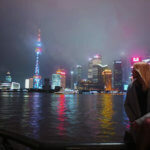 On my world trip, the same funny situation would repeat itself: on board were a lot of couples, young couples, newlyweds, old couples, eventually a pair of friends or siblings…and Lisa! I was so used to it that it always made me smile, especially since everyone was so sweet and people were always impressed (‘You’re seriously doing this by yourself?’). Those 3 days on the cruise we really grew together like a kind of family. We spent our mornings doing Tai Chi on deck with no one around anchoring at some hidden bay in the wide magical ‘Avatar World’. In the afternoon, we went kayaking, visited the Vung Vieng fishing village and had lunch inside a cave. Towards the end of the day, we went for a sunset swim and cooked outdoors on deck and participated in spring roll rolling competitions. I enjoyed calm nights in my big as luxurious suite having a bath while enjoying the panorama view from the bathtub and the silence around me. I totally recommend a 3-day tour instead of one of the shorter tours. Back in HANOI, I had some more time to explore the city. I chose one of the so-called homestays. I met with the others later and everyone kept going on and on about how their hotels upgraded them. Well, mine definitely downgraded me! Hospitality was great though and the guy managing the place gave me tips. ‘Go around the corner to one of the local restaurants and show them what I have just written for you on this paper’. I assumed it was the name of the dish I was later enjoying at that place. Judging by the looks the locals gave me it could have also been some joke about me. Good places to have food is the ‘Quán Án Ngon’, it’s an open-air restaurant: Try the Bùn Chá (BBQ pork, greens, noodles, fish sauce, spices), fresh made spring rolls and have a jelly drink for dessert (they are quite unique). Finish the day off at some location like the ‘Hanoi Social Club’ and one of the rooftop bars like ‘Floor 3’. Every other night the tiny streets transform into busy night markets. Night markets are the simply the best time with so much tasty food! Make sure to not leave Vietnam without having had the traditional Vietnamese Coffee and some egg coffee. Good addresses are: ‘Hanoi House’, ‘Cáfè Phó Có’ and the ‘Hanoi Soul Café’ (Yes, all cafés look like they might collapse any minute and most of them are reached by walking through a normal shop first and entering through some kind of backdoor). You will have the best time in Vietnam by just wandering away from the tourist areas. It’s wonderful to just walk around and absorb the local culture and people’s friendliness. And if you want to visit one of the tourist sights, like the infamous Ho Chi Minh Mausoleum, make sure to cover up (I forgot to cover my long legs!). I was so close to entering the building when the guards marched me off like some kind of criminal…starting to argue about that various others also weren’t covered up only made it worse. Vietnam is magic and I knew when I left that I would be back for sure. I still needed to explore the rice fields of Saapa with my scooter and less luggage. And I still needed to eat so much more tasty food. I guess I will see you soon, Vietnam!